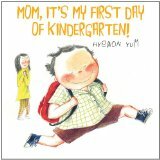 ﻿ Sonderbooks Book Review of Mom, It's My First Day of Kindergarten! Review posted August 10, 2012. I would have never checked out this book. I mean, come on, how many books do we need about getting ready for Kindergarten? When I did read it because it is being considered for the Capitol Choices list, I became convinced that we don't need any of the other books. We need this one! At the start, the big boy is excitedly waking up his little, blue mother, because he's ready to start school. Mom makes my lunch and she starts to worry. "Do they have snacks in kindergarten? What if you don't have time to finish your sandwich at lunch? You'll be so hungry." "I can eat fast, Mom." The picture on that page clearly demonstrates the big, confident boy wolfing down his breakfast in an Enormous Mouthful. All Mom's other worries, he can handle. And he's consistently pictured as large and confident, while Mom is much smaller and completely shaded in blue. "We don't know anyone here. I miss your old teachers and your friends." "I like to make new friends, Mom, and you'll make new friends in no time." On that page, color beautifully dawns on Mom's face and body. She smiles with pink cheeks, and the pink and yellow radiate into her blouse. The top of her head and her legs are still blue, but you can see that she's warming up. The teacher comes out to greet them, and the boy gets his confidence back. And his large size. There's a wonderful picture on the page when the teacher says it's time for the parents to leave. "Mom hugs me, and kisses me, and hugs me, and kisses me." The boy is about to pop from the force of the hugs, and Mom's face is blue again, but she's smiling. There's a truly wonderful double page spread at the end of the day when the Kindergartners are lined up, ready to go home. They are all huge and confident, completely filling the page and smiling. "When we line up, I feel so much bigger." He looks bigger, too. Mom, waiting out in the school yard, is back to blue. But when they have a big hug, she's back to normal color and size. "Mom, can I take the school bus tomorrow, please?" This book is perfect in so many ways. It so wonderfully shows the feelings taking place here, using the art to say so much more than words can. Then there's humor in the Mom's worries, and the confident, reassuring child. But I love that even he has moments of being blue, because that's the way it really happens. If you know of a child getting ready to start Kindergarten, I can't think of a better choice than this book!